On April 25th, 22 years ago a legend of Manchester United club made his debut. Neither he nor the folks who saw that game that day envisioned that this man would join the club’s folklore and become a legend. But it happened. Incidentally, it so happened that yours truly happened to stumble upon this game as it was going on not having a clue who Manchester United was or whom their opponent were(Blackburn Rovers) or why did the team in red sent out this kid who barely looked older than me. The team in red was trailing and naturally, as a kid, I thought you have to back the underdog team. Then this kid goes out and scores within 10 minutes of him coming along and instantly he became my favourite player. That day I decided that the red team will be my team going forward. I didn’t realize at that time that I was rooting for one of the most successful teams of that era or that I wasn’t exactly rooting for the underdog. But that’s life and this article is not about me. It is about that baby-faced man (23 y/o) who went on to become one of the legends of the club. Ole Gunnar Solskjaer was the unlikeliest signing of that season for United as they were trying to land Alan Shearer or Patrick Kluivert. When United signed him after their failed pursuit of the other two, many didn’t think this signing would amount to much. The original plan was to bring him into the reserves and see how he progressed before promoting him to the first team. Ole didn’t feature in his first two games of the season, but what would later become a regular thing he came off the bench for his debut and scored as United took home a crucial point. 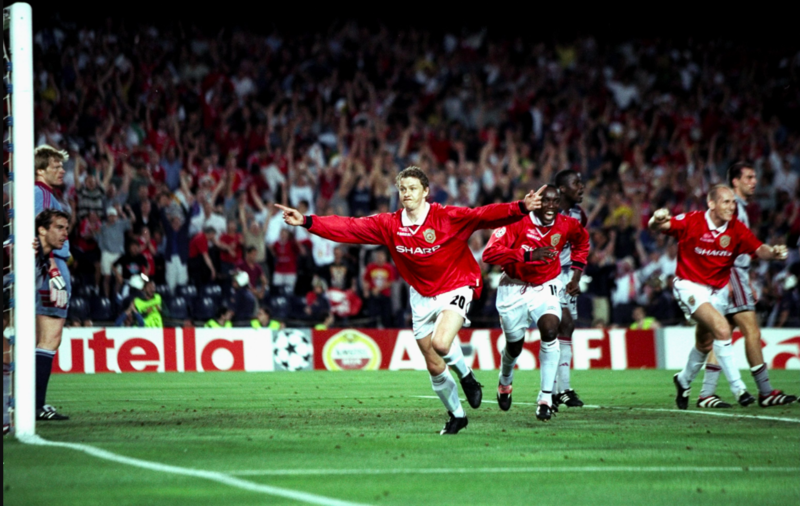 And Solskjaer has won it! Manchester United have reached promiseland! Solskjaer was and will always be a template for how a professional footballer should be. Humble, always alert and eager to step up and deliver when given a chance. He finished his first year as the club top scorer and immediately became a fan favourite. He had the unique ability to be at the right place and make an impact with his goals. I’ve seen very few forwards in my time following United that had the finishing skills of Ole Gunnar Solskjaer. His numbers aren’t the best you might have seen, but his impact at crucial times made him a cult hero. One such instance occurred in April 98 when the score was at 1-1. United were pushing for a winner. The ball broke from a United corner and Newcastle player Rob Lee was through on goal. Ole tried to track him back but ended up with a cynical foul. He was rightly red carded but what followed made him a cult figure at United. It was a rare sight. Ole Gunnar Solskjaer was applauded off the field for getting a red card. Who would have thought? What made him a legend was something that almost didn’t happen. Before the glorious 98/99 season, United had an offer for him to go to Spurs and they accepted the offer. The manager didn’t want to stand in his way of regular football even though he didn’t want to lose him. Despite knowing that he was not going to start every game, Ole decided to stay and fight for his chance. This was at a time when United had Cole, Yorke and Sheringham. In that famous treble season, people might remember that night in Barcelona but he had a crucial impact in the 4th round of the FA Cup by scoring a 90th-minute winner against Liverpool or who can forget the 4 goals in 12 minutes coming on as a substitute against Nottingham Forest. He finished the season with 18 goals including that very famous toe poke. A hard worker with a brain and remarkable finishing skills, he could have easily played for another club and scored a lot more goals. Fans loved his dedication and effort and showered him with love and adoration. Very few rival fans had a problem with him. Aptly named the Baby Faced Assassin, he looked the part as a non-threatening player yet deadly in front of the goals. The fact that Cole, Yorke and Sheringham moved on and he stayed is a testament to his grit, hard work and determination. Injuries between 2003 to 2006 cut short his career and he was unable to make many appearances during that time. Ole took to right-wing in the 02-03 season and Sir Alex in fact, started him ahead of Beckham in the 02-03 champions league quarter-final. This was not just about the manager dropping Beckham due to their spat that season but also a testament to how well Ole adapted to that position. Apart from the odd assist he and there he also contributed 16 goals that season. Injuries to his knee put an end to the possibility of him filling the gap left by Beckham when the latter departed for Madrid. There was a comeback in the 06-07 season. The same season Ronaldo and Rooney came to the forefront and exploded as world-class players. Ole still ended up contributing that season in what would be the first league title for United in 4 years. The recurring knee injury came back again after that season and he had to call his career in 2007. At the time of his retirement, he had the record for most league goals scored as a substitute and he still holds the United record for most goals as a substitute. Till date, the term Super Sub and Solskjaer go hand in hand. His stats as a United player don’t do justice to his legacy at this football club. His goals are not up there with the others greats at the club. He didn’t have as many appearances as the different icons of the club. Yet this man became a legend for a club the size of Manchester United. The Stretford end still has the 20 LEgend banner on till this day. He wasn’t supposed to be where he ended up. United were supposed to get Shearer. But he outstayed players costlier than him and more talented than him. He wasn’t the fastest but as they say sometimes the game is played in a small space in your head and boy was he good to be aware of where one had to be as a striker and make the biggest impact. He’s the perfect example of how hard work, dedication, determination and professionalism can sometimes outshine pure talent. Thus came to be the story of Ole Gunnar Solskjaer – An Unlikely Hero and Legend. He truly made United fans happy when the skies were grey! Read More| Iconic Match Reviews: Barcelona Vs Manchester United, Champions League Final 2011.